This trip start with about 1.5 hiking in spectacular surrounding nature from “Jukla Power Station” to Botna glacier, some glacier rivers has to be crossed. At the glacier we put on all glacier equipment, and after a safety brief the route goes straight up the Botna Glacier icefall, then crossing over the top of Juklavass glacier and over to Jordal glacier (where Folgefonn Summer ski center is located). This trip is a “complete” glacier experience. 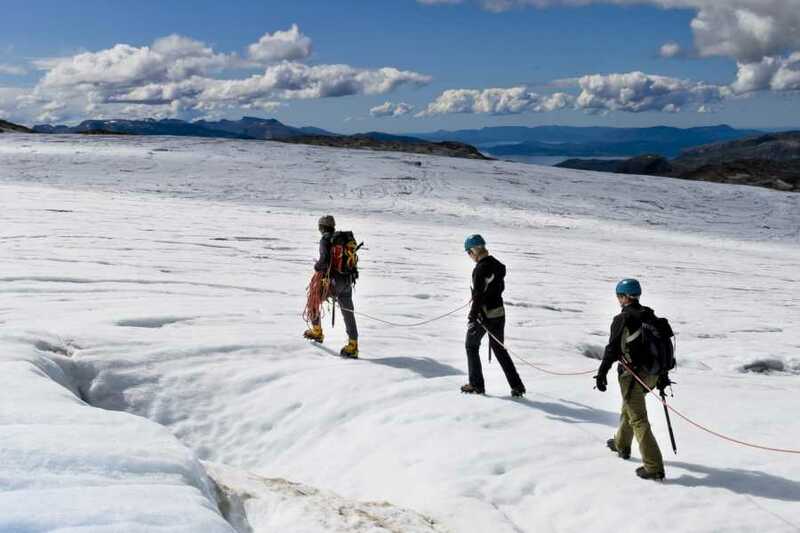 The feeling of climbing an ice fall and meet the glacier plateau with magnificent view of the Hardanger fjord, North Sea, Rosendal alps and the Folgefonna plateau is fantastic. Alternatively, instead of climbing up the whole icefall, we can return down the same way as we came. This trip start with about 1.5 hiking in spectacular surrounding nature from “Jukla Power Station” to Botna glacier, some glacier rivers has to be crossed. 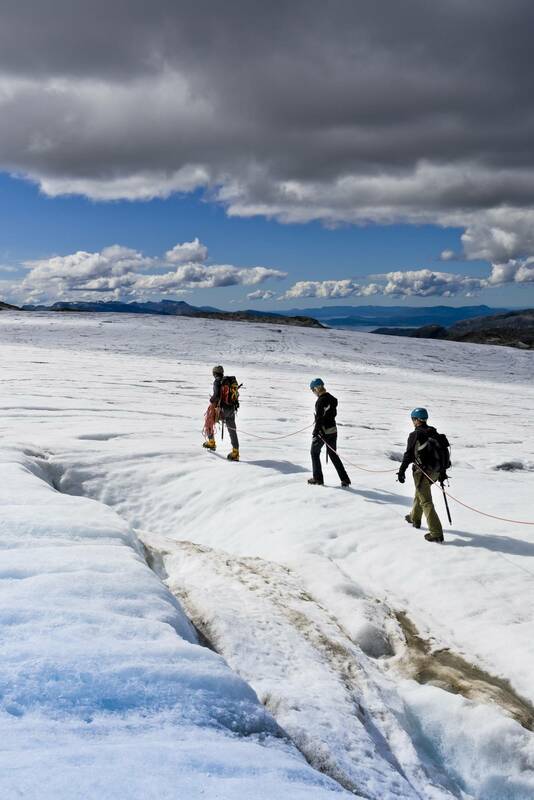 At the glacier we take on all glacier equipment, and after a safety brie trip the route goes straight up the Botna glacier ice fall, then crossing over the top of Juklavass glacier and over to Jordal glacier (where Folgefonn Summer ski center is located). This trip is a “complete” glacier experience. The feeling of climbing an ice fall and meet the glacier plateau with magnificent view of the Hardanger fjord, North Sea, Rosendal alps and the Folgefonna plateau is fantastic. The trip starts 780 masl at Jukla Power Station, there is about 1.5 hours walking up to the glacier (1050 masl), the nature here is wild and spectacular. In front of glacier you take on all the glacier equipment and steps into the blue ice for safety brief. The ice fall is about 1 km in length, and at the top you are 1450 masl. Depending on time and group-wishes there will be lunch break in the blue ice. 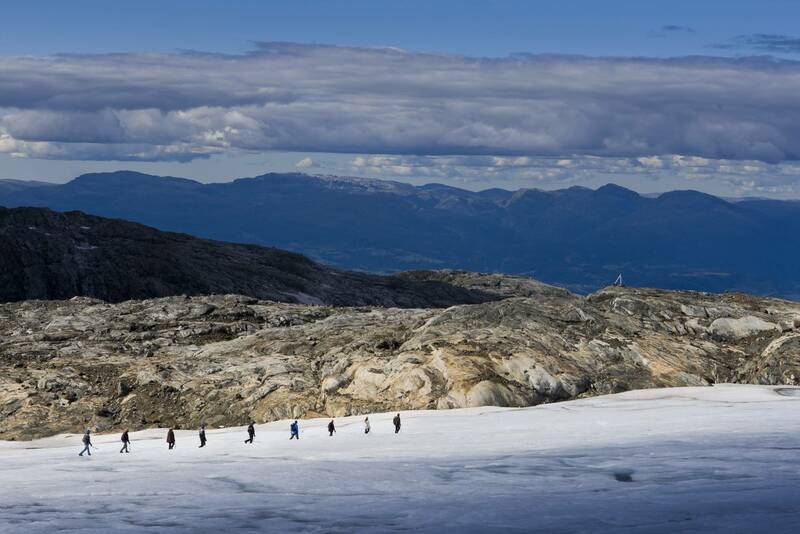 From the top of Botna glacier we hold the height directly North, crossing over the top of Juklavass glacier, and over to Jordal glacier. 15:50 we catch the bus from Folgefonn Summer ski center to Jondal. From our office Juklafjord in Jondal we organize transport back to where you parked your car. In total the trip is approximately 7 km in length, and elevation gradient is 750 meters. 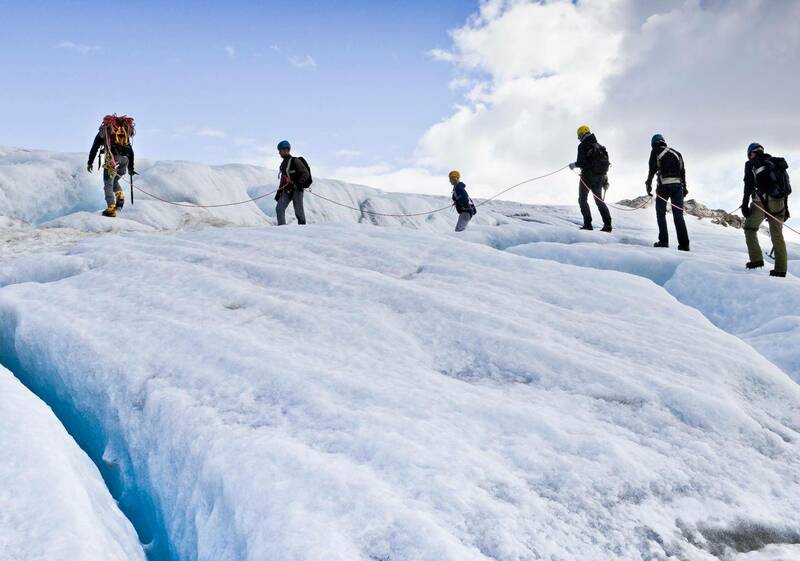 Alternatively, instead of climbing up the whole icefall, we can return down the same way as we came. The season for this trip is from about 15 of June until the 1 of September (depending on snow conditions). The ski bus Folgefonn Summer ski center-Jondal is available 26.6-20.8.2017, outside this period alternative transport can be organized. From 09:30 to 15:50, in total about 6.5 hours. Time length including transport back to where the trips started is estimated to 7.5 hours. Warm, wind-and water proof clothing (depending on weather), gloves, mountain boots, food and something to drink. Sunglasses and sun lotion is also recommended. Included in the price is crampons, ice axe, harness, helm, rope, and mountain boots. We need to know your show size when you book the trip. Mountain boots are in sizes from 33 to 48 (EUR). We also offer rental of clothing, Gore-Tex and fleece (reservation of clothing has to be done when trip is booked). For sale we have sun glasses, sun lotion, maps, snacks, lunch food. 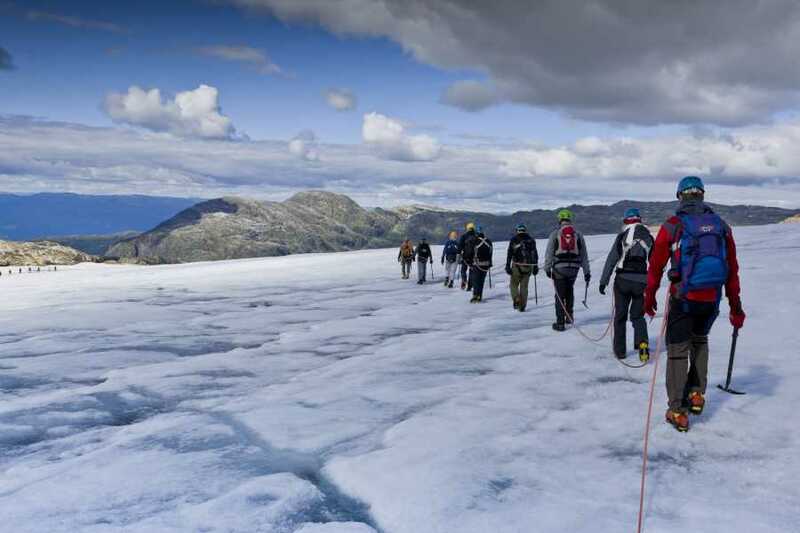 6500 NOK, maximum 6 persons in group, price includes all necessary glacier equipment also mountain boots. In additional there will be transport cost if we choose to walk over to the ski center, this will vary depending on size of group. Payment Cash/card at our office Juklafjord in Jondal. For people with address in Norway we can send invoice. Fixed price 6500 NOK, maximum 6 persons. Price includes all needed glacier equipment.